Diamond Credit Union learned that it ranked 14th among mid-sized companies in the 2018 Best Places to Work in PA survey and awards program. It was announced in September that Diamond earned a spot on the list for a third consecutive year. The Credit Union was also ranked in 2017 and 2016. Diamond Credit Union is a not-for-profit, member-owned, full-service financial institution. Diamond strives to bring opportunity and financial stability to every member of the community. All 180-plus Diamond employees are on a mission to make banking a uniquely personal experience for members by guiding, growing and giving back. For driven and passionate people who want a dynamic and rewarding place to work, Diamond Credit Union considers its employees its most valuable resource. Diamond treats employees with dignity and respect, blends hard work with fun, often promotes from within, and embraces new ideas. Acting with integrity and showing initiative are staples of Diamond’s culture. Diamond challenges employees to maximize their potential and supports them with every opportunity to do so. A comprehensive training program and ongoing educational opportunities give every employee the foundation they need to contribute immediately and take their career to the next level. Opportunities to grow professionally are abundant. Just as important, so are the opportunities to grow as a person. Diamond employees volunteer a lot of time in the community. Employees support Relay for Life, United Way, and many other great organizations and causes by raising funds and awareness. The impact Diamond has on these community organizations is inspiring. The impact it has on employees is humbling to see how coming together impacts those in need. Community events also provide fantastic opportunities for employees to bond and develop camaraderie. Celebrating and recognizing a job well done goes a long way. Surprise food days that feature tacos, pizzas baked on site, ice cream, Italian ice, and more are always a hit; as are monthly treats to celebrate all birthdays. Employees enjoy the celebratory food perks with little worry thanks to Diamond’s Wellness Program. Regular deliveries of fresh fruit, advice, cooking demonstrations, recipes, blood pressure screenings, chair massages, rewards, prizes, and more are hits. There is also an opportunity to participate in a monthly step challenge for which Diamond outfitted employees with pedometers. All of this is built on a foundation of generous medical, dental, vision, and prescription plans; excellent vacation and holiday time; a great 401(k); and more make Diamond one of the Best Places to Work in Pennsylvania. Nurturing a fantastic work-place culture that fosters excellent member service … That’s younity! 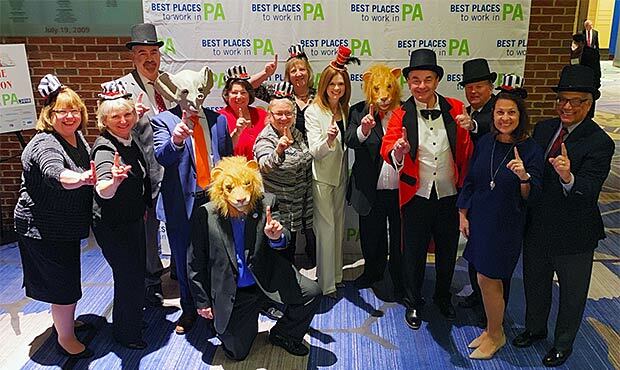 Members of Diamond’s Board of Directors and senior management get into the spirit of “The Greatest Showman” at the 2018 Best Places to Work in PA Awards.